Note: This is a guest post by Janet Flewelling, director of human resource operations with Insperity, a business that has been providing HR and business solutions for 25 years. We’re honored to have her on the blog. Businesses that properly plan for disasters are more likely to continue to operate and flourish than those that simply leave things to chance, according to the Insurance Information Institute. What should be done if the company building or office space is damaged or destroyed by storm-force winds or water? Where would the business operate in order to continue providing services to customers? Would necessary resources, databases, contact information and other important items be available to adapt to a change in location or operations? Company files and data are the lifeline of a business. 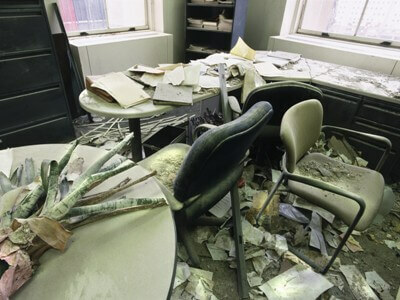 If the computer system or information contained in its files is destroyed, it can be extremely difficult to reconstruct important financial information, client databases or employee records. Having a secure, offsite facility that stores and protects this information will help make the recovery process more manageable. Decide which employees are absolutely critical to the emergency response effort and which employees could better serve the company by working from home. Make sure employees are aware of their status and responsibilities during an emergency situation. If a remote site has been identified for the essential employees to conduct business after a disaster, inform the employees of the location, travel arrangements, and lodging plans. A solid strategy must be put into place to ensure employees, families, service providers, contractors and the general public are all kept abreast of the situation. Topics and appropriate responses may change depending on the audience. For example, who will communicate human resources related information to employees and how will that communication be accomplished? Who is responsible for communicating with insurance carriers? If there are widespread power outages, what forms of backup communication are in place? Traditional delivery methods may include implementing a call tree, email blast or advisory distributed to local media. As mentioned, some utility services, including electricity and conventional phone lines, may be interrupted for hours or even days. Backup communication methods under these circumstances could include cell phones or social media channels. A good tip to inform employees is that there are times when text messaging works, even when cell phone coverage is unavailable. A designated spokesperson should be assigned to handle communication to the public. This person should be aware of all of the pertinent details related to the business and serve as the single contact for any outside inquiries. The company spokesperson must be an integral part of any team that surveys damage and determines next steps. All communication must be kept consistent and truthful. Review existing insurance policies on all business properties and facilities, including motor vehicles, to ensure adequate and appropriate coverage. Keep those policies in a safe, offsite location and have instructions for their use and access, including contact information, policy numbers, coverage periods and policy restrictions in the disaster preparedness manual. After a disaster, the business that becomes operational first is in the position of being ready to serve existing customers and take on new ones while the competition continues to struggle. One of the best ways to ensure a swift recovery is to negotiate strategic partnerships with key trade-industry professionals including carpenters, plumbers, electricians and the like – before a natural disaster strikes. Contact information, location and area of expertise should be included in the disaster preparedness manual for each trade-industry partner. In a disaster situation, it is not uncommon for employees to search for pertinent information about company closures, their paychecks or even job status. Being prepared to respond to questions from employees, customers and the news media is critical during a natural disaster. If a comprehensive disaster plan is created and in place before disaster strikes, business owners are in a strong position to confidently handle and successfully manage the recovery process with minimal disruptions to their business. Janet Flewelling is director of human resource operations with Insperity. Insperity (NYSE: NSP), a trusted advisor to America’s best businesses for more than 25 years, provides an array of human resources and business solutions designed to help improve business performance. InsperityTM Business Performance Advisors offer the most comprehensive Workforce OptimizationTM solution in the marketplace that delivers administrative relief, better benefits, reduced liabilities and a systematic way to improve productivity. Additional offerings include MidMarket SolutionsTM, Performance Management, Expense Management, Time and Attendance, Organizational Planning, Recruiting Services, Employment Screening, Retirement Services, Insurance Services and Technology Services. Insperity business performance solutions support more than 100,000 businesses with over 2 million employees. With 2010 revenues in excess of $1.7 billion, Insperity operates in 56 offices throughout the United States. For more information, visit http://www.insperity.com.